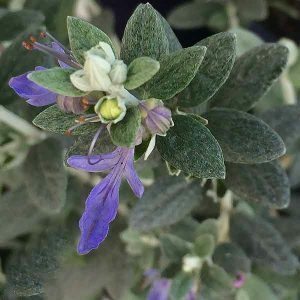 With attractive foliage and flowers Teucrium fruticans is a low growing bushy shrub with lilac blue flowers in spring. Also known as the ’Silver Germander’, this is a hardy drought tolerant plant, aromatic silvery green foliage and very easy to prune to shape. Best grown in full sun and a well drained soil is a must. As long as drainage is good, it will tolerate a range of soil conditions including coastal soils. When first planted you will need to water Teucrium fruticans through its first summer, once established, little to no extra watering will be required. Use this is a Mediterranean style garden, suited for use as a stand alone shrub, as a semi formal hedge or for growing in containers. The best time to prune is after flowering, for a more formal look, clip lightly 3 to 4 times a year when in active growth. For heeding try a planting distance or spacing at 75 cms to 1 metre. Can be used as a substitute for a Lavender hedge, and is usually longer lived. F. fruticans azura ‘Silver and Saphire’ – Silvery foliage with deep blue to purple flowers. F. fruticans ’Silver Box’ – Grey green foliage and pale blue to lilac flowers. Pruning – The best time to prune is after flowering. Teucrium fruticans is available for sale from the following participating nurseries.